Cut each chicken breast into 3 pieces for a total of six. Puree tomatoes (with their juice) in a food processor or blender until smooth. In a saucepan over med-high heat, saute onion and garlic for 1 minute. Add chicken, sprinkle with salt & pepper, cook & stir for 1 minute. Add remaining ingredients. Bring to a boil, reduce heat, cover and simmer for 50 minutes. Remove lid, increase heat a little, and cook 10 minutes more until sauce thickens. Serve over your favorite pasta. 36 Comments on "Spaghetti With Chicken"
We don’t use sugar either. If you want sweetness, try shaved carrot strips. Home made pasta is not as hard to make as it seems. No machine. Roll the dough as thin as you can, flour, rollup jellyroll style, cut narrow strips, unroll, dry a bit and you are in. Thanks for the recipe, good to hear from you again. Can’t WAIT to try your no- knead bread and rolls.! Don’t have a Dutch Oven…would placing a pan of hot water on rack below bread while it is baking work or spritzing the back of the oven surface at several intervals ?LOVE your videos and the fact you leave nothing to guess work. It’s SO helpful knowing what the dough should look like at various stages…thank you, thank you, thank you!! Can’t wait for your next recipe. So glad you’re back and giving us a new recipe. You have so many followers that love you and your recipes (including us). Hope all is well and you’re looking for more Fall/Winter recipes to surprise us with. We’ve missed you recently. We’ll try this chicken recipe soon. We are always looking for chicken recipes, as it seems that’s all we eat any more. DEAR JENNY, PLEASE DO NOT GET OFFENDED BUT, ITALIANS DO NOT USE SUGAR. TRY SOMETHING DIFFERENT WITHOUT THE SUGAR. THE TOMATOES GET BLOCKED OUT BY THE TASTE OF SUGAR. IT OVER-RIDES THE TRUE TASTE OF ANY GRAVY OR SAUCE. ASK ME: YOU CAN ALWAYS CALL BECAUSE I HAVE LUPUS, AND I SLEEP IN BETWEEN (phone number redacted) MY HANDS ARE SWOLLEN. I MADE FROM SCRATCH EVERYTHING EXCEPT THE PASTA, I AM TOO SICK TO MAKE MY PASTA.—WE USE TO LAY IT ON A BLEACHED WHITE SHEET WITH FLOUR AND WAIT FOR THEM TO DRY. THAT IS THE REAL WAY. (phone number redacted) I CAN NOT TYPE ANYMORE!!!!! has confidence when using Jenny’s recipes. I love your recipes. They always work. Just finished making your bread sticks and they were great. I tell everyone how your recipes always work. I make your wheat bread all the time. I can’t wait to try the sauce with the chicken. I have been cooking for 45 years but I always learn something from you. First, it does not need to be complicated to be good. Secondly, always have a pretty smile on your face like you do. You make me happy watching your videos. Please tell me you have a blooper videos. Welcome back to my Inbox Jenny. Great to see you posting another new recipe! Looking forward to more fun ideas from you. Take care and thanks for the yums! So glad to find you in the Inbox, Jenny. The recipe looks good, and we already have all the ingredients in the house! Will be making this over the weekend. Please keep the videos coming. How about cheese bread? Love the simple but delicious recipes you have. I also Love, Love the video’s! Welcome back, waiting for more. When do you add sugar and Italian seasoning? Aw, I’m so excited to see you’re back! I hope there will be new YouTube videos to follow. Fingers crossed. I love your recipes and am grateful no matter where you share them. Always wishing you and yours love, healing and happiness. Love your video’s and recipes Jenny. Made several and love every one. My favorites off hand are Easy Pan Pizza & Easy Granola !! Keep your recipes and videos coming !! You make cooking so easy ,your the only cook that makes me feel like l truly create a great meal .Your such a joy to watch.Look forward to more great recipe’s Thank you. Jenny I am 69 year old single man trying to learn to cook. You could do something different than other “cooks” on You Tube. Make your recipes in smaller portions for single people. Some would say just divide it, well it doesn’t always work that way. It would also make you more unique. Respectfully, Jim. Good idea! As a person similarly disposed, I also am frustrated by the absence of recipes for the single eater. As you say, dividing a recipe rarely works–we need recipes calculated for the single, individual cook. I’m single but would never think of making a single portion. Whenever you cook, make enough for several meals and freeze what you won’t eat within a couple of days. My freezer is full of homemade soups, pasta dishes, breads, etc. That way I don’t have to cook a full meal every day. Also you can invite friends or family over for a meal or deliver a meal to a sick friend or someone in need. If you want a single serving, make a sandwich or a salad. 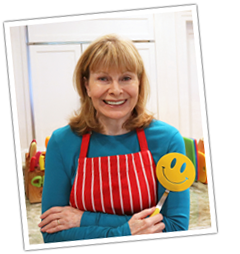 All Jenny’s recipes are fabulous and I’ve tried many. Several are my “go to” favorites. Good for you. Leftovers make great frozen tv dinners. Thank you, Jenny, for what you do! I love to watch you! It’s really refreshing! You are such a hoot, and your cooking is really fun! It’s really a break in the tough times lately to get to watch you! You’re really precious! Thank you! You have been on my mind so much lately. How are you doing with the loss of your sister?? I know it has to be hard. Connie I am sure you mean well. Perception is reality. But each person’s perception is different. As to referring to Jenny’s personal loss. I know from experience that when you lose someone you need and most often want to hear people talk about them. It is real. Cannot pretend. As for the other, I saw only good intentions in Mrs. News comments. All good. Just saying. Best of everything to Jenny and her fans. Mrs. News is a friend and I know she meant well but thank you for considering my feelings. I am fine with her note. Thank you for your’s and Love Only’s thoughtful input. I apologize for my poor interpretation. 💟. Sorry if I came off wrong, you have been on my mind so much. I don’t have a way to get a hold of you anymore. I do want you know I care and I am thinking about you. Maybe my perception was wrong and I am sorry if it irked others. You know me and I know you know my heart. 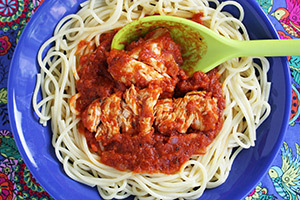 I still LOVE chicken and tomato sauce so I know I would love this recipe. But I would love it more if we were sharing it at the same table. So glad you’re back! Please make more YouTube videos. I make your bread all the time. I want to try your perogis next.